Superestate offers two investment options to help you reach your retirement goals, with flexibility to tailor your investments to suit your changing needs, whatever your stage of life. 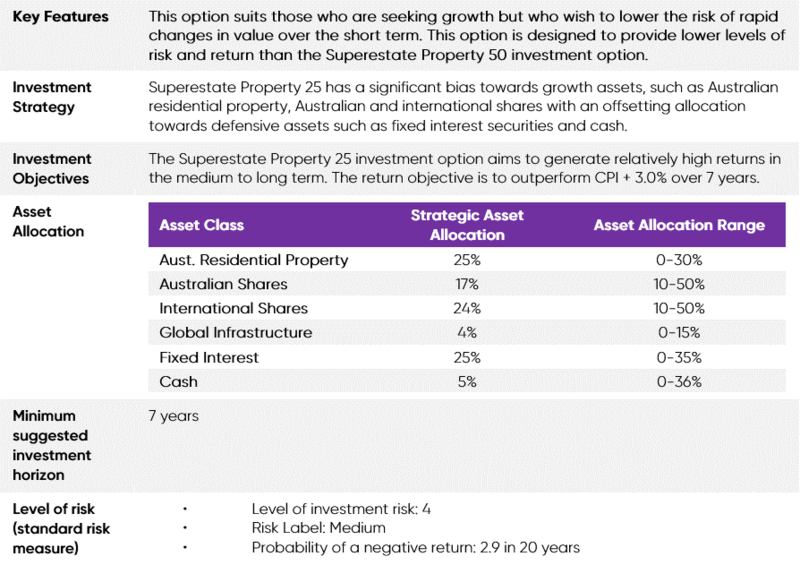 The Trustee has provided you with a selection of two flexible investment options in Superestate. You are able to choose between them. From time to time the Trustee may change the available investment options. 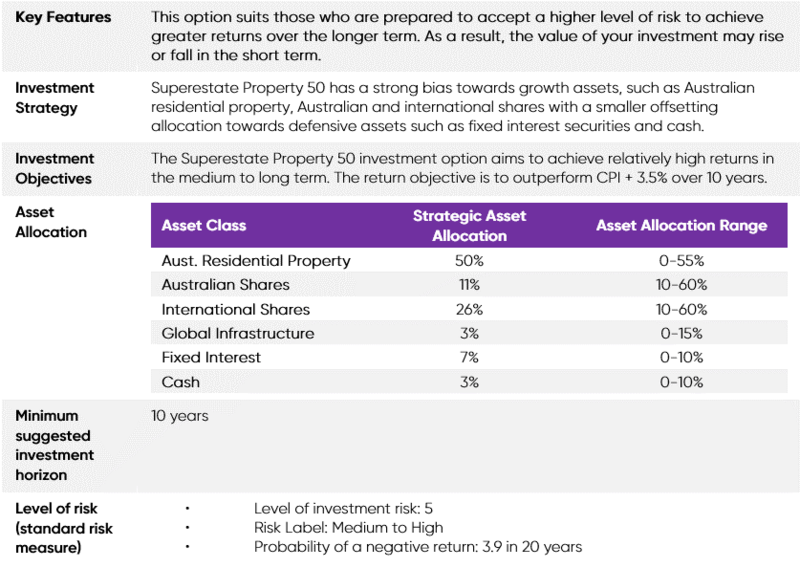 When you first join Superestate, it is a condition that you must choose your investment option, because there is no MySuper (default) investment option. If you do not choose an investment option, you will not be admitted as a member of the fund. All of the underlying investments are collective investment vehicles. The investment returns are net of investment managers’ fees and taxes. You should read the Product Disclosure Statement and Reference Guide for more information on How We Invest Your Super. These fees and costs may be deducted from your money, from the returns on your investment, or from the assets of Superestate as a whole. Unless otherwise stated, all fees and costs are shown inclusive of GST and stamp duty if applicable. We do not reduce the fees by any income tax deduction we (or an interposed vehicle) may be able to claim. * See ‘Defined fees' below. ** With the exception of fees for personal financial advice that you have agreed with your financial adviser. 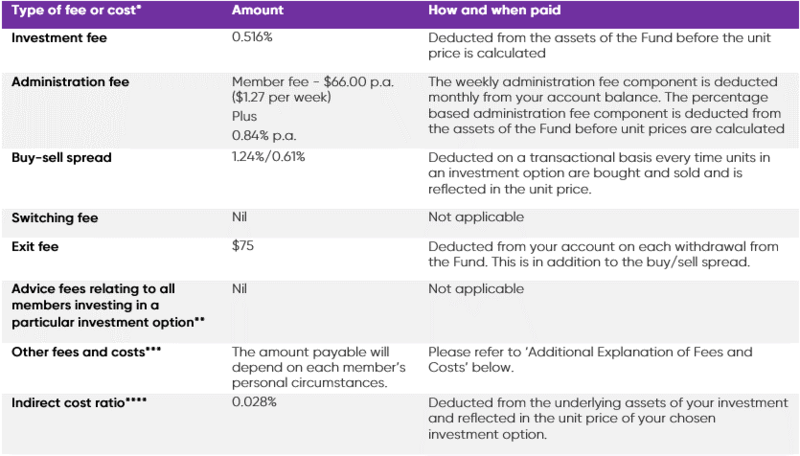 See the section ‘Additional Explanation of Fees and Costs’ below for a detailed explanation. *** Activity fees may also apply (i.e. insurance administration fees and fees for personal financial advice that you have agreed with your financial adviser, and fees that you have consented to the Trustee deducting from your account). See ‘Additional Explanation of Fees and Costs’ below for a detailed explanation. **** The indirect cost ratio (ICR) shown above is an estimate for the 2017 Financial Year. The actual amount you will be charged in subsequent financial years is not currently known and could be different. See the section ‘Additional Explanation of Fees and Costs’ in this Guide. You should read the Product Disclosure Statement and Reference Guide for more information on Fees & Costs. or even death. Automatic Death, Total Permanent Disablement (TPD) and Income Protection cover is provided to eligible members when first joining Superestate. Income Protection cover is provided by YourCover Pty Ltd, ABN 351 6903 8466, AFSL 461299 on behalf of various Underwriters at Lloyd’s. Warning: Your entitlement to insurance cover may be affected by eligibility restrictions for certain cover and conditions and exclusions on cover that might apply (e.g. for pre-existing conditions). You should read the information about eligibility restrictions, conditions, exclusions, premiums, and other important information set out in the Insurance Guide before deciding whether the insurance is appropriate. Income Protection is provided up to the lesser of a maximum of $10,000 per month or 75% of monthly salary. Generally, you will be eligible for default Death cover if you are aged at least 16 years, until you reach 65 years. Generally, you will be eligible for default TPD and Income Protection if you are Actively at Work on the day you joined Superestate and are at least 16 years, until you reach 65 years. There are costs associated with insurance cover called premiums, which are deducted from your account. The premiums you pay depend on a number of factors, including, but not limited to, the level and type of cover, your age, gender and occupation. Warning: if you do not cancel your automatic insurance, premiums are automatically deducted from your account each month. In the event there is insufficient money in your account, your insurance cover will lapse and all insurance benefits cease. Premiums may rise from time-to-time. In accordance with legal requirements, we will notify you at least 30 days beforehand if this occurs. Upon joining eligible members will receive the Automatic Death/Terminal Illness cover, and TPD and Income Protection cover. Therefore you do not need to do anything to apply for Automatic cover if you are eligible to receive it. Please refer to the Insurance Guide for full details of eligibility for automatic cover. You can cancel or reduce your insurance cover by calling Member Services on 1300 519 800 who will advise you of the necessary action you must take to cancel all or part of your insurance. You should read the Product Disclosure Statement and Insurance Guide for more information on Insurance.